Various Asian news outlets revealed on Thursday that North Korean dictator Kim Jong-un and wife Ri Sol-ju received nearly $400,000 in personal gifts during their visit to Beijing last week. 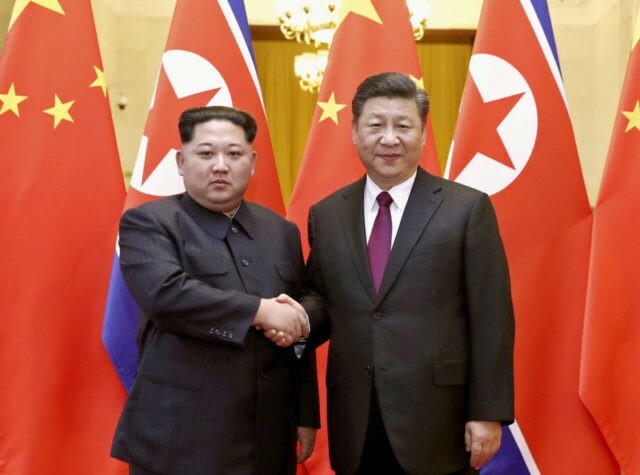 Chinese Communist Party head Xi Jinping reportedly offered the ruling couple expensive liquor, fancy tea cups, and jewelry in gratitude for their secret visit to China, Kim Jong-un’s first trip abroad as dictator of North Korea. South Korea’s Chosun Ilbo, citing Hong Kong’s Apple Daily, reported that Kim received “a large vase [worth] 500,000 yuan, and plates and porcelain teacups at 20,000 yuan and 5,000 yuan each,” according to footage of the gifts that appeared on Chinese television. Xi’s wife Peng Liyuan gifted Ri Sol-ju jewelry and an expensive blouse, the report notes. The gifts totaled an estimated 2,470,000 Chinese yuan, or $390,926.9o. The gifts, Chosun notes, violate United Nations sanctions on North Korea. The sanctions forbid the sale or gifting of jewelry generally and “tableware of porcelain or bone china (valued greater than $100).” The sanctions on luxury goods are meant to pressure the Kim regime into dismantling its illegal nuclear weapons program, which Kim has insisted is necessary due to the ongoing Korean War (while hostilities ceased, the United States and North Korea never signed a peace treaty). Such luxury also stands in stark contrast to the daily lives of North Koreans, literally starved to death by their regime’s insistence on funding nuclear weapons over food for their citizens. North Korean defectors have testified to eating grass, boiling rats, and resorting to cannibalism to survive. Kim made his first trip abroad last week on a train to China after weeks of concern in Chinese state media that Kim was reaching out too directly to South Korea and the United States. State media insisted that Kim extending an invitation to U.S. President Donald Trump to meet personally, and Trump accepting that invitation, would not “marginalize” China, North Korea’s largest patron and trading partner. While Chinese officials first claimed they had “no idea” whether Kim was in the country or not, communist state-run publications later interpreted Kim’s visit as a victory of Xi, giving the Chinese leader full credit for Kim’s alleged newfound openness to denuclearization. On Thursday, Reuters reported, citing the Nikkei Asian Review, that among the proposals discussed during Xi’s meeting with Kim was a return to “six-party talks” on denuclearization. The talks, which concluded in 2009 and failed to result in any meaningful diplomatic change, would include the United States, Russia, Japan, China, and both Koreas. Including Russia and China would help North Korea with diplomatic leverage, as both are governed by anti-American regimes that have reportedly aided North Korea in the past. While China supports North Korea openly, Russia has been caught conducting illicit business with the regime, violating UN sanctions. Chinese officials did not confirm the report on the talks.